The Delaware Contemporary's industrial chic lobby and contemporary art galleries provide an ambiance sure to impress for any event. We have experience planning and hosting weddings, fundraisers, corporate networking events and everything in between. Situated amid the array of attractions on the Riverfront Wilmington, with easy access to I-95 and Amtrak, our location is perfect for out-of-town guests. The elegant Westin hotel provides complimentary shuttle service to the museum and competitive room block rates. The Atrium Lobby, our premier event space, is perfect for a variety of special occasions, including holiday parties, dinner dances, bar and bat mitzvahs, and wedding receptions. The space is flexible enough to accommodate an intimate dinner event for 50 or gala affair for 300 guests. Nonprofit discounts are available. The Wings Foundation Auditorium is a perfect daytime setting for an early-bird breakfast, lunch conference, or afternoon shower. In the evening, it is ideal for a performance, program, or small wedding ceremony with theater style seating for 120 guests. AV equipment, a 20-foot projection screen, and video wall are included. Galleries are open to guests for the duration of your event. Arrange a guided tour, scavenger hunt, team-building event, or gallery talk to add interest! 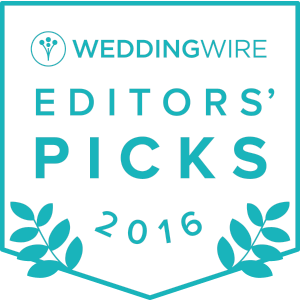 Book your wedding now at one of WeddingWire's 2016 picks for Best Venue for Art Lovers! "The Delaware Contemporary is the most unique and unforgettable space, and my guests couldn't stop talking about it. Not to mention the staff, who were accommodating, patient, responsive, and just kind-hearted people all around."